Mrs. Lentz of Pennsylvania is getting help from Veterans Home Care’s VetAssist Program to apply for a VA Pension known as “Aid and Attendance.” She is the surviving spouse of a wartime veteran. New VA rules effective October 18, 2018 open the door to more deserving wartime veterans and surviving spouses who are over age 65 and need help at home. KTRS Radio’s Jennifer Blome and Jay Gray’s Veterans Day talk show mentioned recent changes from the Department of Veterans Affairs (VA) regarding a little-known pension for elder wartime veterans and surviving spouses. Veterans Home Care CEO Bonnie Laiderman summarized the key changes to the Pension often called “Aid and Attendance” such as an increased net worth limit and new rules for transferring assets to meet the net worth limit. Bonnie has unparalleled expertise helping people apply for this specific VA benefit. Jennifer Blome: Welcome back everyone. It is 11:09 on this Veterans Day holiday. It's Monday, November twelfth. 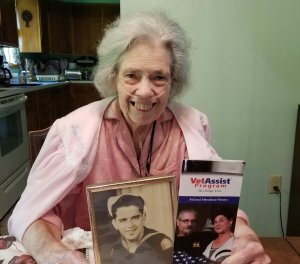 If you're a veteran or a surviving spouse, there's a program called the VetAssist Program that can help you. Bonnie Laiderman joins us online. Bonnie's the CEO of Veterans Home Care. Bonnie. Thanks for joining Jay and me. Bonnie Laiderman: Good morning. Thank you for having me. Jennifer Blome: So one of the things you were telling me about is that there are new changes to a VA benefit, which is known as Aid and Attendance. Can you tell us what that is? Bonnie Laiderman: Yes, there are. It is a change in the dollar amount of liquid assets. They have changed it from a maximum of $80,000 to $123,600. They are following the format of Medicaid where there is a look-back period. Jennifer Blome: And Bonnie, you told me you started Veteran's Home Care because you had a family member who had trouble accessing benefits. Can you tell us about that? John Gray: Is this through the VA or is this a combination of Medicare, Medicaid and VA? Bonnie Laiderman: It's strictly a VA pension. My company is a private company. We are not part of the VA.
Jennifer Blome: So, who pays you? Bonnie Laiderman: The client pays us through giving them home care. We earn our living in giving our clients home care. Bonnie Laiderman: They use the money from the pension. Jennifer Blome: Okay. And Bonnie, you said that a pension exists for veterans who have non service-connected disability? Jennifer Blome: But their disability does not have to be as the result of their service. Is that correct? Jennifer Blome: So who in our audience, um, might need your help and how can they get in touch with you? John Gray: And it is amazing how many things are available. The morass of regulations and rules and statutes out there. It's no wonder many veterans don't know what they're entitled to and many of the surviving spouses or the spouses, the kids, whatever it is, there are things that are available and they just don't know. Bonnie Laiderman: The number is 888-314-6075. Jennifer Blome: Bonnie Laiderman, CEO of Veterans Home Care. Thank you so much for joining us on KTRS again, the number if you need help. 888-314-6075. Thank you Bonnie for chatting with us. Bonnie Laiderman: Thank you. Have a wonderful Veterans Day!